Now that the weather is finally starting to cool down, you might be thinking about finally pulling your bike down from the spot it’s been sitting all summer in your Energy Corridor apartments. We’ve been seeing all the crazy people biking in 100-degree heat all summer, but now it’s cool enough for the more casual bikers to come out of hiding. Luckily, there are plenty of bike trails in West Houston that are just waiting to be explored! In this week’s blog post, we’ll be talking about some of the bike trails that are worth checking out. Houston is filled with paved trails and dirt trails alike, so don’t have to be an avid off-road biker to enjoy biking through this city. You do, however, have to have a sense of adventure. Once you’ve got that – and your helmet — you’ll be all set to enjoy the trails on the list below. Without further delay, let’s get right to the list of trails! When you’re done reading through this list, please feel free send the link to this page to your friends and neighbors living at Alexan CityCentre — the Energy Corridor apartments Houston residents choose for luxury living. Some of the best trails in Houston take riders right along the bayous, and the first trail on our list is no different. If you feel like doing the whole trail, you’ll be signing up for a 33 mile ride. 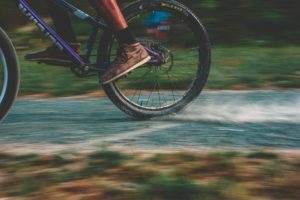 You can obviously do a shorter ride if you want, but the trail doesn’t have too many elevation changes, so you should be able to complete the full ride without too much trouble. We’re especially fond of the flowers and plant life on this trail. You can see bluebonnets in the spring and various other wildflowers in the summer and early fall. Check it out if you get the chance! Head on over to the nearby Memorial Park for a 3-mile trail that loops around the edge of the park. Not only is this park conveniently located, but it’s filled with criss-crossing trails that cover up to 30 miles. We recommend looking at a map before you go, because some trails turn into off-road trails rather unexpectedly. If you’re into the whole off-road thing, however, this park should be right up your alley. Last but not least, we have a bike trail that takes you over creeks and under bridges. We love the variety at Terry Hershey Park, and we’re especially fond of the fact that the only elevation changes happen when you go over bridges. Most of the trails at Terry Hershey are paved with asphalt, so you shouldn’t have any trouble navigating the terrain at this urban park. With that, we’ve reached the end of our list of our favorite bike trails in the Energy Corridor neighborhood! We’d like to thank you for taking some time out of your busy fall schedule to read this week’s blog, and we hope that you’ll come back to read our next post when it goes live on our website. In the meantime, be sure to check out some of these bike trails next time the fall weather makes you feel like getting outside! If you enjoyed reading this latest blog and you’d like to be among the first to read the next one, please be sure to bookmark our blog page so you can enjoy easy access to the page again when our next post goes live on the site. Until then, be sure to follow Alexan CityCentre on social media! That’s the fastest, easiest way to ensure you’re always in-the-know with regards to resident events, special promotions and giveaways happening at your community of apartments in West Houston.